Acute urinary retention (AUR) describes a symptomatic inability to completely empty the bladder. AUR is a relatively common complication in the post-surgical patient, so a clear understanding of its diagnosis, assessment, and management is important. *In the immediate post-operative period, any neurological deficit is usually because the spinal or epidural anaesthetic has not yet worn off, but other more potentially serious neurological causes should be considered. 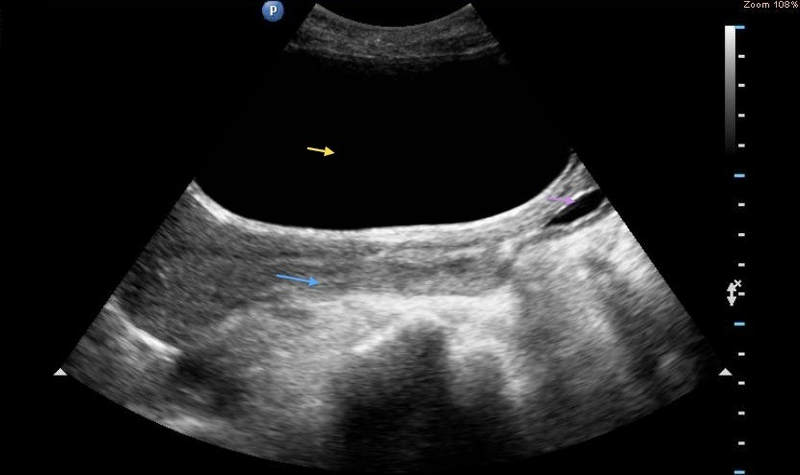 Together with a thorough clinical assessment, the most important investigation is the ultrasonic bladder scan to identify the post-void residual urine volume*. A conservative approach may be taken in many patients; the majority of post-operative urinary retention will resolve spontaneously given time and withdrawal of any causative agents. Which of the following is NOT a sign of urinary retention? Which of the following is NOT a risk factor for post-operative urinary retention? What is the most appropriate initial investigation for post-operative patients with urinary retention? What is the best approach to manage a post-operative patient in acute urinary retention, with a urine volume grater than 600ml and in significant pain?